We always receive brilliant reviews of the “Tap” from dog owners not only for its dog friendliness but also for its food (especially the burgers). The manager has said that Sunday is their “dug heavy day” where they can have up to 12 dogs in. It’s also great if you love ales as there is a lot of choice and changes often. It is one we highly recommend if you are in Stockbridge (over 18’s only no bairns allowed). 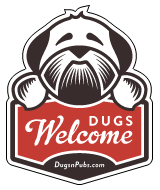 They were the first pub to receive our Dugs Welcome sticker! There are a total of 10 dog friendly listings in the Stockbridge Pubs category. Please log in, or sign up as a member to view all listings.